The MamaBear app makes iPhone GPS tracking an extremely powerful solution for modern parents who want a little help with child monitoring. MamaBear combines several key features into an iPhone app that’s both easy to use and easy to understand. 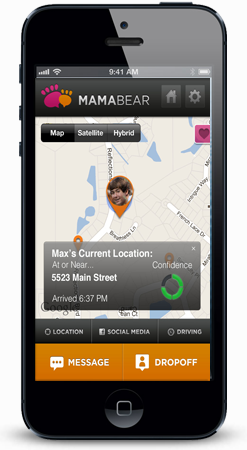 MamaBear uses a combination of GPS technologies and iPhone features to give parents an effective set of tools for locating kids in a variety of situations. The MamaBear GPS location app for iPhone is as simple to use as it is to download and install. With MamaBear, iPhone GPS tracking for your children is an extremely simple process. Once the account has been set up and logged into correctly on the child’s phone, all a parent has to do to locate children is open up the app on an iPhone or web connected iOS device and choose which map option to use on the GPS tracker. It’s a fast, easy and effective tool for child tracking. MamaBear offers parents a quick solution for parents who want regular updates on the kids’ location. MamaBear can issue parents an alert any time the child leaves a selected location, like school or work, outside of schedule times. The app can also send an alert anytime a child enters an address parents have chosen as restricted. The MamaBear alerts on iPhone are push and email based messages that give parents flexibility on how they want to check in with the app. MamaBear outshines many other options when it comes to using an iPhone GPS to track kids. Even kids who are in transit are easy to track with MamaBear. We offer parents real time alerts on real driving speeds. Parents can program the app to give them an alert anytime a child exceeds a certain speed. Setting the speeds low can ensure children are not driving at inappropriate times, or are only using surface streets. Many parents using MamaBear have found the app facilitates children checking in frequently. Some children check in more than they did before the app was installed on their iPhone. Children can use the single button interface on their view of the app to issue parents a GPS tagged alert on their location. This makes checking in fast, easy and unobtrusive for kids. Showing our children the app’s utility as a communication tool makes tracking our kids with an iPhone a bit easier. In addition, parents can do the same and share their location as a push notification to their child at select times. MamaBear for iPhone makes tracking kids easier in emergency situations. When children are in the proximity of a disaster or other dangers, MamaBear can be invaluable. MamaBear allows parents and kids to find one another quickly in emergencies. MamaBear also enables children to alert parents with a one touch emergency button. This gives kids a simple solution to let parents know they are in a bad situation. With MamaBear for iPhone, enabling GPS tracking for children is as easy as logging into the app. We designed MamaBear to create dialogs with our families by using the most advanced GPS tools at our disposal. MamaBear allows parents and kids to contact each other quickly and easily in a wide range of ordinary and extraordinary situations.